This book is focused on upcoming freight brokers who are just getting started in the business; dispatchers, truckers, owner operators, freight agents, 3PL Logistics coordinators, etc., those whom are in the field of transportation, trucking industry, and logistics supply chain. Charlotte, NC, April 16, 2019 --(PR.com)-- In today’s economy, Freight Brokers are in high demand. In the United States, there are about four thousand licensed Freight Brokers. A Licensed broker can be either a company or an individual, and the companies which contact them may rely wholly on them for shipping needs, thus eliminating a need for an in-house department. Licenses are issued by the Federal Motor Carrier Safety Administrator (FMCSA) and they must prove adequate insurance coverage to cover client loses. 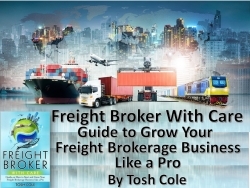 Tosh Cole’s “Freight Broker with Care, Guide on How to Start and Grow your Freight Brokerage Business Like a Pro,” in this book, she educates the reader on how they can become a successful Freight Broker, cold call techniques, how to negotiate rates and much more. Her in-depth advice will help a new Freight Broker learn how to earn a high rate of salary. Tosh Cole has mastered the concepts and beneficial strategies that can help anyone become a successful and well-rounded freight broker. She has over twenty years of experience in Logistics and has used this expert knowledge to write her highly informative book.